View cart “Pay for Card Replacement” has been added to your cart. This is where to pay for the replacement card. 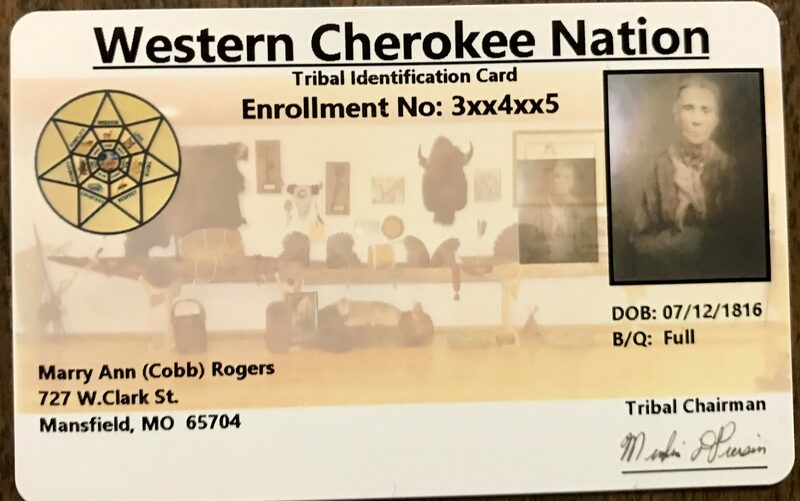 Each card must have the form filled out and submitted with a digital copy of the photo to use sent to westerncherokeecard@yahoo.com (the photo can be attached to the email that sends the form) and payment made before the card will be created and sent. Cost: The price for this will be $25.00 per card on all replacement cards. Payment may be made by using credit card or Paypal, or a check may be sent if mailing paper forms. A. Photo: Can be a selfie, as long it is relatively plain background, and no unusual or obscene gestures. Can use photo off Driver’s license if you wish. Passport photo quality would be good. B. Driver’s License or Photo ID Scan: This is to make sure that the selfie is who you say it is. Copy only, do not send original! C. Roll Number: Will be best to scan your membership card if available (please don’t send membership card or driver’s license as a color copy is all we need). You should keep your old membership card in a safe place. D. Legal Name: May have Indian name in “ “ but must be under 3 words. Also may include Maiden Name. E. Date of Birth: Will also need date of birth. F. Current Address: Even if we have your current address, we will want to make sure everything is correct. G. Do You Want Blood Quantum: This is an option you may choose, yes or no. Some schools & activities do require it. H. Cost: The price for this will be $25.00 per card on all replacement cards. Payment may be made by mailing a check with the paperwork, or using Mastercard, Visa, or Paypal on the Shop tab of the https://westerncherokee.co website. I. 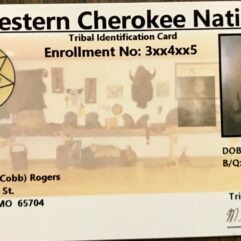 Send To: Send all correspondence to westerncherokeecard@yahoo.com.